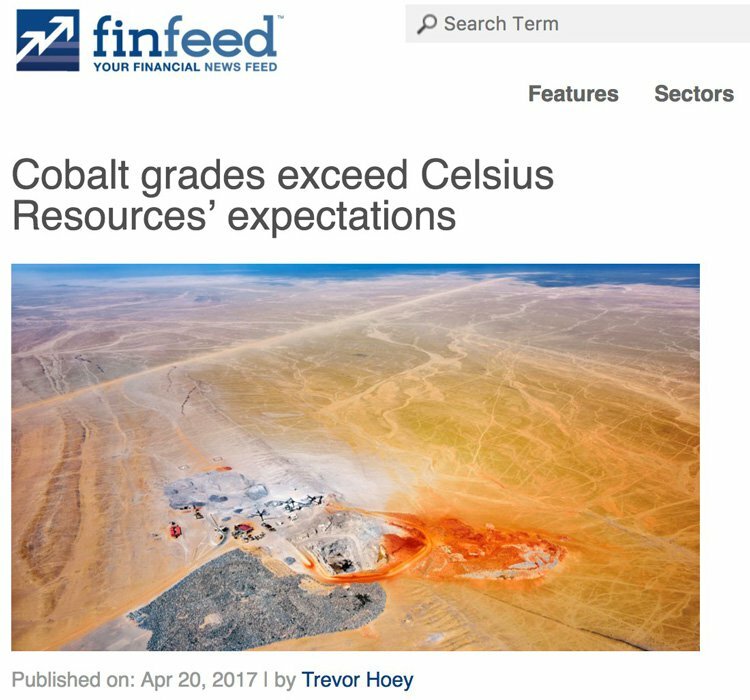 Forward looking Celsius Resources’ (ASX:CLA) decision to focus on the lucrative business of cobalt just as demand surges, could be a potential masterstroke for the company. Especially as the rise of new and innovative technologies such as electric vehicles really begins to gain traction. When CLA management redirected the company’s operations last year, it flagged its intentions for its lofty cobalt ambitions and wasted no time in working towards its goal of defining a mineral resource at its Opuwo Cobalt Project in Namibia. It should be noted here that Namibia is not without its problems, and this is a very high risk stock for political and social reasons. Getting mining projects up and running in countries such as Namibia is no simple feat, and there may be challenges ahead. CLA also installed well-credentialed consultant geologist, Brendan Borg as Managing Director , which brought immediate interest to the company as Borg has 20 over years’ experience and specialised in the battery materials sector, with involvement in various lithium, graphite and cobalt projects and has a deep understanding of managing projects in Africa. Borg also has intimate knowledge of the Opuwo project and was instrumental in quickly initiating the drilling program that is currently underway. So far, all seems to be going to plan. Just last week, big news has come out of the junior explorer regarding its drilling program at its Namibian operations with the company reporting that better than expected cobalt-copper-zinc mineralisation has been intersected. This comes just two months after we first brought you CLA , right after the small cap cobalt explorer had agreed to acquire 100% of Opuwo Cobalt Pty Ltd — the company that holds an option to acquire the Opuwo Cobalt Project. You may recall, that to gain exposure to the project CLA is acquiring the company via staged exploration expenditure. At the time CLA was gearing up to begin a drilling program at the project in Namibia. This strong cobalt-copper-zinc mineralisation was intersected close to the two historical holes drilled in 2015. These historical drill holes have been the basis of CLA fast tracking its own drilling program including the four holes already drilled across the 1.9km, with the historical holes in between. And that’s just the results from four of the 20 holes that were recently drilled, with drilling continuing to test 30km of prospective strike extent within the project. 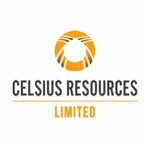 Celsius Resources’ (ASX: CLA) announcement that results are in from its first four drill holes at its Opuwo Cobalt Project in Namibia is a promising update for the company that is focused on rapidly progressing its evaluation of the project. CLA recently became involved with the Opuwo Cobalt Project via a staged investment in exploration activities. To gain exposure, CLA will earn an initial 30% interest through the expenditure of $500,000 within six months of exercising the option to proceed. It can then earn a further 30% after spending $1,000,000 within 12 months of completing the stage 1 earn in. And finally, CLA can earn another 16% buy spending a further $1,000,000 within six months of completing the stage 3 earn in. Once CLA has earned its 76% interest, all parties will be required to contribute to exploration. With 20 holes now completed for a total of 1,627 metres, there are still a lot of assay results due over the coming weeks... and more news flow throughout the year as the exploration program rolls on. So far, investors have been very receptive to news flow from the company. 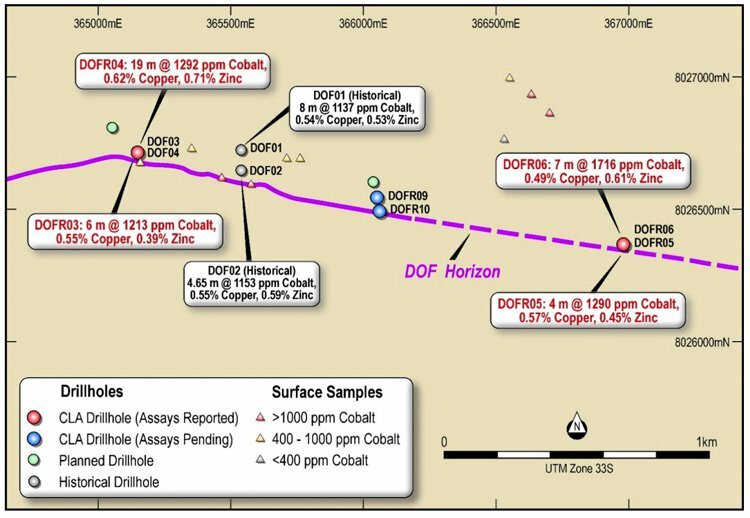 Assays received so far, from samples from the first four holes, have confirmed strong cobalt-copper-zinc mineralisation at locations approximately 400 metres west and 1,500 metres east of the two historical holes drilled in 2015. This has extended the strike length of mineralisation confirmed by drilling assays to 1.9 kilometres. The mineralisation extends to surface and outcrops in many places, and while results from just a few holes have been received so far, the grades appear to increase with depth — which could mean quality of the results could keep improving as exploration progresses. This is particularly impressive given that assays for only four of the drill holes have been received so far. Although it should be noted that the company is still in its early stages and investors considering this stock for their portfolio should seek professional financial advice. 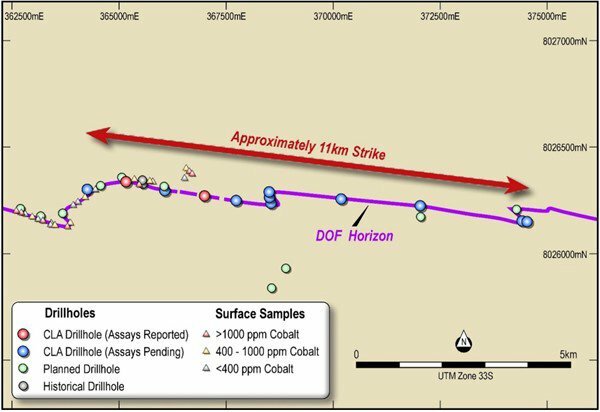 The map below outlines the cobalt-copper-zinc mineralisation identified in assays that extended the mineralised strike to 1.9 kilometres. You can see the four holes and their results in red text (holes DOFR03, DOFR04, DOFR05, DOFR06) and the historical drill holes and their results in black (holes DOF01 and DOF02). Within these intersections were the notable high grade zones of seven metres grading 1,321 ppm cobalt and two metres grading 3,075 ppm cobalt. While it’s still early going in the exploration process, the presence of these high-grade zones of cobalt and copper within the mineralised zone provides confidence that there is significant upside still to be uncovered at Opuwo. 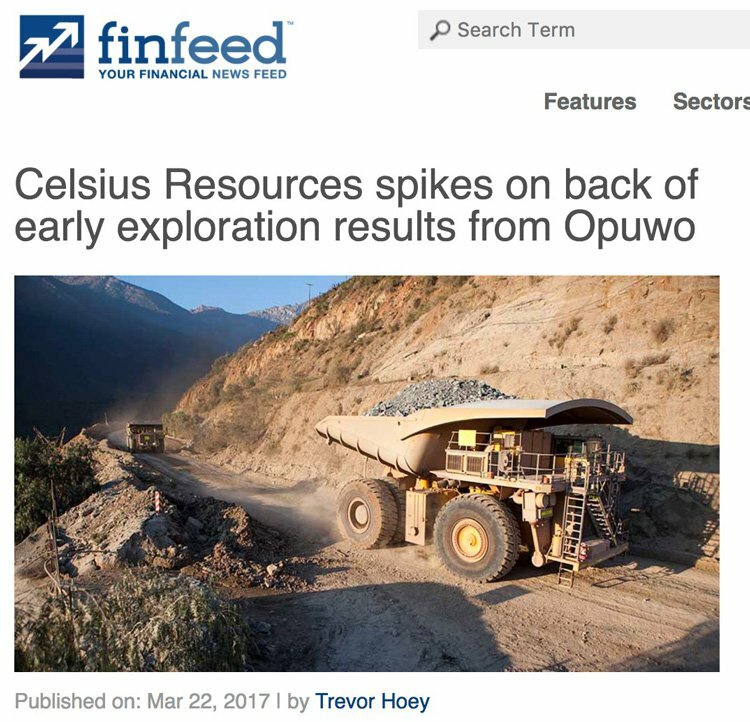 Early exploration results back up management’s confidence the Opuwo project in Namibia and in a reassuring sign to investors, the company has expressed optimism that a significant tonnage of cobalt, copper and zinc can be defined at the Opuwo Project. These early exploration results are extremely encouraging given that the underlying focus on this area was largely based on two discovery holes that were drilled back in 2015. It is also important to note that some drill holes were designed to intersect the mineralised zone at right angles and provide an approximate true thickness while other holes were drilled oblique to mineralisation. This means that under further investigation at depth, angular drill holes could confirm the presence of higher grades at depth. 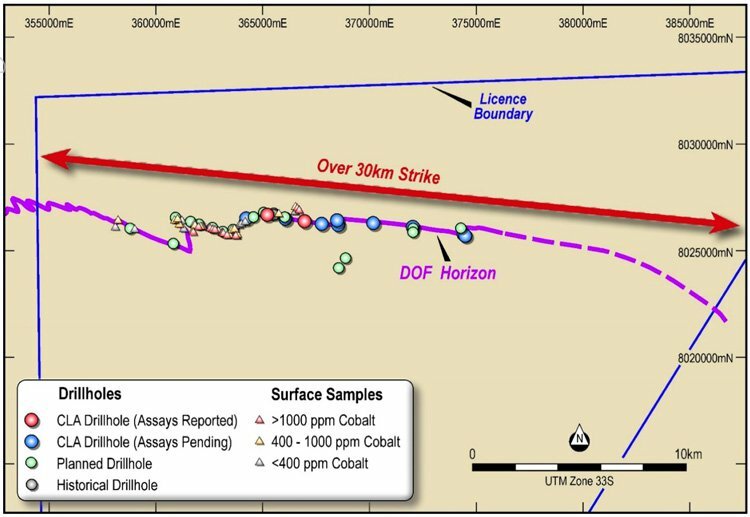 This initial phase was designed to test a 20 kilometre strike length of the cobalt copper mineralised Dolomite Ore Formation (DOF) horizon — of a total 30 kilometre strike length — and the mineralisation that is hosted within it. To date, a total of 20 shallow holes have been completed for 1,627 metres. Wide spaced drilling has been completed across 11 kilometres of strike as shown below with the mineralised horizon intersected in each drill ‘fence’ to date. Here you can see the drilling locations that extended the mineralised strike to over 11 kilometres. In areas of poor outcrop, CLA uses geophysical data to help with drill targeting. The announcement of a complete set of results from this first drilling program by CLA is the next news item on the radar. Following that, a diamond drilling program is scheduled to commence in early May, providing samples for first-pass metallurgical testing. The planned metallurgical studies, plus preliminary mining studies and resource definition drilling are expected to contribute to a scoping study for the project, which is planned to be completed by the end of the year. Any ASX stock that can identify serious commercial quantities of cobalt stands to be rewarded and this will only be boosted with the rising cobalt price, which has now shot through the US$55,000 tonne price. Cobalt prices may still have further to run. Macquarie analysis found that 2017 could be cobalt’s year as it takes over from lithium as the go-to power storage mineral. This was based on increased demand from the core portable electronics sector as recovering, while supply growth remained relatively stagnant. 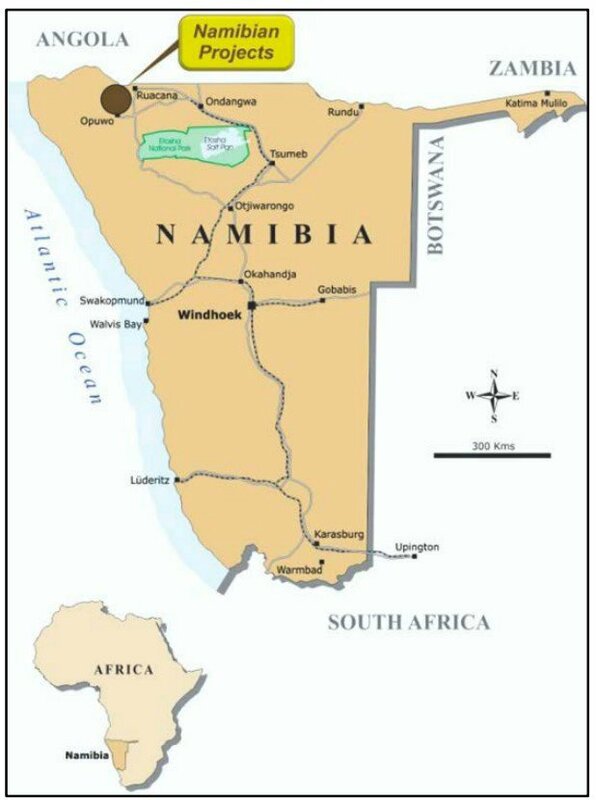 Firstly, while located in the cobalt heavy region of Central Africa, the Opuwo Cobalt project is in the politically stable country of Namibia. The project itself is located 800 kilometres from the nation’s capital and 750 kilometres from a shipping port — all connected by bitumen roads. The second benefit of mining in Opuwo in Namibia is due the country having lower political risk than countries such as the DRC. 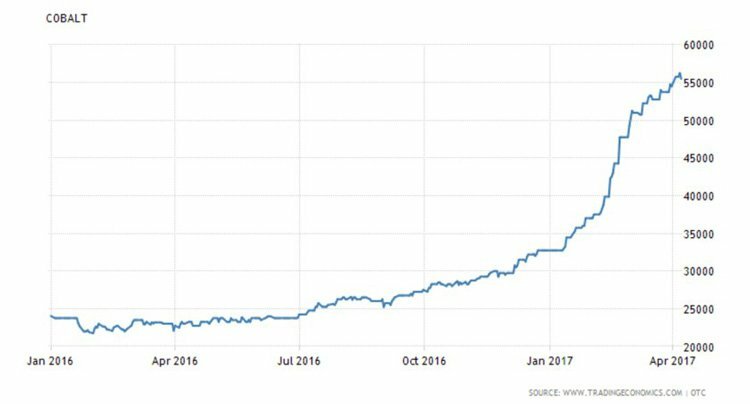 While there’s no doubt that demand for cobalt overall is rising, demand is rising exponentially for ethically sourced cobalt. This factor is becoming more and more valued, especially by multinational corporations such as Apple and Microsoft which operate under a microscope from investors and human rights groups. There is a lot of concern around cobalt mined in the politically unstable Democratic Republic of Congo (DRC), where 65% of all cobalt production comes. Namibia offers an alternative ethical source of cobalt production. Keep an eye out for further assay results which should keep flowing in over the coming weeks. If the upcoming results are anything like that of the first four drill holes, we can expect CLA to move quickly onto the next stage of the exploration program. That next step will be diamond drilling to provide samples for first pass metallurgical testing. This is scheduled to begin in early next May. So, there is a steady news flow to come from CLA as it begins to up the ante on its cobalt exploration ambitions in an environment that could bring real benefits in the future.